Deanne Anderson, MS,OT/L holds a bachelor’s degree in occupational therapy from Quinnipiac (College) University and a master’s degree in educational leadership from Central Connecticut State University. She is currently studying for her doctoral degree in Educational Leadership at the University of Hartford. Deanne is currently the program director for the Occupational Therapy Assistant Program at Goodwin College in East Hartford, CT and an adjunct faculty member at Quinnipiac University. Her areas of specialty include neurological dysfunction, visual and cognitive impairment, executive dysfunction and educational advocacy. She has worked extensively with clients with neurological deficits. This includes feeding strategies, cognitive dysfunction, and visual, perceptual and motor dysfunction. Deanne is a registered Advanced Therapeutic Listening practitioner. In addition, she is certified in Sensory Integration Treatment and Evaluation. She has worked in a variety of practice areas which include home health care, acute care, and rehabilitation across the age span. She brings over twenty four years of clinical and practice management experience to Creative Development. Deanne has authored a chapter for a book on multidisciplinary rehabilitation and she has written several articles for OT Advance, the national magazine for the American Occupational Therapy Association. 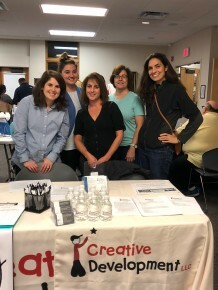 Deanne is currently the Special Interest Section co-chairperson for the Connecticut Occupational Therapy Association. Deanne has authored a chapter for a book on multidisciplinary rehabilitation and she has written several articles for OT Advance, the national magazine for the American Occupational Therapy Association. Lauren Gillis Coughlin, MS, OTR/L earned her Bachelor of Science degree in occupational therapy from University of Hartford and she earned her post-professional Masters of Science degree in occupational therapy from Boston University. Lauren specializes her occupational therapy practice in pediatrics using a holistic, child-centered approach, utilizing the child’s inner motivation as a guide for therapy. Lauren believes in a family centered approach where parent/family carryover and participation is key to helping the child become more independent. She has experience working with children of all ages from infancy through age 21 and has worked in various private pediatric clinics, Connecticut Birth to Three, pediatric home care, various school districts and acute care settings. In addition to practicing for almost 20 years, Lauren brings over 10 years of practice management and clinical supervision experience to Creative Development. Areas of research interest are autism and social participation; sensory integration; the promotion of normal development in infants and how development affects the child’s ability to effectively play and learn; and prevention of becoming a picky eater and feeding development. Lauren has provided both community consultations and several community presentations in these areas. She is also currently an adjunct faculty member for Goodwin College’s OTA program and teaches their pediatrics course.In addition, Lauren is an adjunct faculty member at Quinnipiac University. She takes pride in acting as the liaison for various colleges.Lauren supervises multiple Level II occupational therapy fieldwork students yearly. Teaching and collaboration with the community are extremely important to Lauren. She has co-authored a chapter on Therapeutic Listening in the Schools as well as written pediatric practice exam questions for the OT assistant national exam. Lauren is a member of the American Occupational Therapy Association (AOTA) and Connecticut Occupational Therapy Association (CONNOTA). Lauren is a registered Advanced Therapeutic Listening provider and is certified in sensory integration treatment and administering/interpreting the Sensory Integration and Praxis Tests (SIPT). Jessica Tuthill, OTR/L is a graduate of The University of New Hampshire with a bachelor’s degree in Occupational Therapy. She over 10 years of clinical experience in a variety of settings including; sub-acute, outpatient therapy and acute care. She has worked with a variety of patient populations including Neurological, orthopedic, neonatal, cardiac, oncological, and post-surgical patients. Jessica has worked extensively in the N.I.C.U., working with a multidisciplinary team to provide evaluations and developmental assessments to pre-term infants. She has worked closely with families, social services and nursing to provide all of her patients with quality care. Jessica’s interest in working with the pediatric population began with her work in the school system during an internship while attending the University of New Hampshire. She has experience in designing developmental programs, performing standardized tests, and developing individualized education plans. Jessica is the community liaison for Creative Development, working to develop strong relationships with community partners and to develop therapeutic community programming. Sue Carey, MS,OTR/L (Ready Set Go, LLC), graduated with a Bachelors of Science degree in Rehabilitation Services from Springfield College,in Springfield, MA, and a Masters of Science degree in Occupational Therapy from San Jose State University, in San Jose, California. Sue has had the privilege of working as an occupational therapist with both adults and children in a variety of settings since 1992. Sue spent her early years as a therapist working on a Rehabilitation Team primarily supporting adults and teens recovering from traumatic brain injury. It was at this time she developed an in interest in how the brain learns and is able compensates for injury and differences. Following this time, Sue had the opportunity to work as a seating and positioning specialist, supporting professionals in Northern California, Northern Nevada, Idaho and Montana. It was here that her interest working with younger children was fostered, so in 2000, Sue went to work for Marin County office of Education where she worked with children birth to teens, including those with complex medical issues, children with Autism, children with Speech and Language disorders, children with learning disorders and children with sensory processing differences. Sue believes that it is essential to work with clients and their families to understand their challenges at home, in the community and school environments. She also takes time to have the family be a part of creating solutions and to include the child is a part of daily goal setting when appropriate. She believes that the clinic experience should be a safe place to practice skills that can foster greater independence outside of the clinical setting. Sue feels that supporting a child’s goals with a home practice program or ‘homework’ is the best way to bring the skill into life outside the clinic. Sue has enjoyed continuing her education taking classes in visual perceptual rehabilitation, neurodevelopmental Treatment, self regulation, sensory integration and handwriting to name a few. Sue is Sensory Integration and Praxis certified, a Therapeutic Listening Provider and has worked with the Handwriting Without Tears Program since 2000. Working with families as a whole to empower children to use their strengths, embrace their challenges and use both to become their best selves is what she hopes to achieve each day. Sarah Bengtson, MOTR/L-earned her Master’s degree in Occupational Therapy from Bay Path University. She also has a bachelor’s degree in Exercise Science from Southern Connecticut State University. During her graduate studies, she completed her clinical fieldwork at Creative Development, LLC and with the older adult population, which focused on holistic medicine, alternative treatments, group therapy, and advocacy which she carries over into her treatment sessions. Sarah has experience working with children of all ages and with a variety of diagnoses such as sensory processing disorder, Down syndrome, Cerebral Palsy, developmental delay, and Autism Spectrum Disorder as well as children who have difficulties with feeding, social skills, and self-regulation She has experience working with variety program or protocols within her sessions, such as, Handwriting without Tears, Zones of Regulation, and Michelle Garcia winner’s Social thinking curriculum. Sarah is also certified in Therapeutic Listening. She has become a mentor to OTR students, providing supervision and guidance during their clinical fieldworks. In her free time, she enjoys play hockey, cooking, and taking her dog on hikes! Brooke Bochese, MOT, OTR/L- BIO COMING SOON! Kristen Sutton, MOTR/L- BIO COMING SOON! Carrie Carroll,COTA/L obtained an associate’s degree in Occupational Therapy from Goodwin College in 2011. She has a broad background working with children, as well as the geriatric population. She worked as a daycare/preschool provider, a licensed patient care assistant at Ct. Children’s Medical Center and a paraprofessional in the public school system just to name a few. She supported children of all ages with varying disabilities, such as physical, behavioral and educational before embarking on her career path as an Occupational Therapy Assistant. She has worked with children with cerebral palsy, Down syndrome, Autism, sensory impairments, and other developmental delays in both public school and private practice. She also has worked in multiple Rehab and SNF facilities helping individuals regain function and activities of daily living. She enjoys working with the pediatric populations in all areas and settings. She has attended various educational seminars to further her knowledge and special interest with helping children with feeding difficulties or “Picky Eaters”. Other areas of interest include assisting children with challenging fine motor deficits and emotional dysregulation, by incorporating “Handwriting without Tears and “Zones of Regulation” into therapy sessions. In 2013, Carrie became and continues to be a mentor to new and upcoming COTA graduates by supervising and providing guidance throughout their fieldwork studies. Laurie Ekwall, COTA/L holds an associates degree in occupational therapy from Becker Junior College in 1985. She has 15 years experience in the field working with a variety of clients including traumatic brain injury, geriatrics, acute care, and working with the pediatric population with extensive health issues in the hospital setting. She took time away from her profession to stay home with her two daughters. During this time she took a position in the primary classroom of their Montessori school working with 3-5 year olds and eventually took a position working in the toddler room. She joined Creative Development 6 years ago and is happy to be back practicing occupational therapy in the clinical setting. In 2015 Laurie completed a year long study with the Institute of Integrative Nutrition and received her Health Coaching Certification. She decided to become a Health Coach to fulfill her passion for working with children and their parents to adopt a healthier lifestyle by providing guidance and inspiration to help shift their behavior to healthier habits by making step by step changes to their diet and lifestyle. She embeds her health coach certification into her every day practice at Creative Development. Leah Cheshire, COTA/L– BIO COMING SOON! Leda O’Connor, COTA/L earned her associate’s degree in Occupational Therapy from Goodwin College in 2017. She has a broad background working with the adult and geriatric populations as a Certified Medical Assistant & Medical Biller for 12 years, in both the hospital and private practice settings. She also has 10 years’ experience working with children, as a paraprofessional in an elementary school setting. Leda has worked with children and adults with Autism, ADHD, Cerebral Palsy, developmental delays, Down syndrome, sensory processing disorders, and various other impairments that affect daily participation. Leda enjoys being able to utilize her wide range of education and experiences while working with and caring for children and their families at Creative Development. In her free time she enjoys spending time with her family and friends, cooking, camping, and reading. Krislyn Donadio, COTA/L is a graduate of Providence College with a BA in Social Work. For 17 years, Krislyn worked for a large nonprofit mental health facility in Rhode Island. During this time, she provided counseling, case management, crisis response and direct support services to at-risk youth ages 4 to 12. She received her M.A.T. in Elementary Education from Rhode Island College and then functioned as an educational advocate for children in therapeutic residential care. Krislyn received extensive training in therapeutic crisis intervention techniques and has worked with children with a variety of diagnoses including: ADHD, OCD, ODD, RAD, PTSD, PDD, and Asperger’s Syndrome. In 2012, Krislyn left her job as the Assistant Director of a therapeutic treatment home to return to Connecticut to help take care of her elderly father who required both occupational and physical therapy. As a result of this experience, Krislyn became very interested in the field of Occupational Therapy. In 2015, she obtained an associate’s degree in Science (Occupational Therapy Assistant) from Goodwin College and now practices OT in both pediatrics, in a clinic setting, and gerontology, within a skilled nursing facility. Krislyn truly enjoys her work—using her wide-ranging education and experience to help people of all ages to be as independent as possible by assisting them to improve both necessary and meaningful activities of daily living. During Krislyn’s free time, she likes spending time with friends and family, traveling, watching movies, and attending Broadway musicals. Beatriz Lopez, COTA/L earned her associates degree in health sciences from Goodwin College in 2013 and graduated from Goodwin College as a certified occupational therapy assistant in 2015 with Deanne and Lauren being her teachers and mentors. Beatriz is a bilingual Spanish speaking professional who has 10 years of professional experience working in women’s health, as a Medical Assistant, prior to going into occupational therapy. Beatriz’s fieldwork experience consisted of school system in a non traditional setting at a preschool working with children within the ages of 3-5 years old, and at a Hospital in Mental health acute setting, patients age ranging from adolescence to geriatric. Beatriz has worked with children with Autism, ADHD, sensory processing disorders, and various impairments that affect daily participation, with Creative Development being her first official employment since August 2015. Also Beatriz has worked per Diem at Natchaug hospital serving the mental health community. Beatriz believes mental health is a part of the holistic medicine, and loves to serve the pediatric population, in collaboration with other therapists and the caregivers of the clients. Sapora Bogatz, MS,CCC-SLP received her undergraduate degree from the University of Connecticut, Storrs and her master’s degree from Northeastern University. Sapora enjoys working with the pediatric population and has experience working with with children ages 2-21. Sapora is trained in the ADOS and is level I PROMPT trained. Her specialty skills include receptive and expressive language disorders, articulation disorders, and social communication intervention. Sapora has experience working in the school setting and has knowledge of the connection between language and the K-4 curriculum. Sapora also has experience working with children diagnosed with Autism Spectrum Disorder. In her free time, Sapora enjoys spending time with her family and friends. Jenna Tellerico, MS, CCC-SLP earned both her undergraduate degree and master’s degree from Southern Connecticut State University. Jenna has experience working with children ages infancy-21 from her practicums at Southern, in the Hartford Public school system and from her placement at Creative Development. Jenna has been working as a full time speech language pathologist at Creative Development since graduation. Jenna enjoys working with the pediatric population, specifically with children who have developmental language disorders, motor speech disorders, social language deficits, children on the Autism Spectrum, as well as working with other members of the transdisciplinary team for children with complex needs. Specialized skills include being level 1 PROMPT trained. Jenna also embeds AAC into her therapy sessions with clients when needed. Jenna also collaborates with parents and other team members to promote the best continuity of care and generalization skills. Sean Brown, fitness trainer, is a certified personal trainer. He has been in the field for 6 years and has a bachelor’s degree in public health. He works side-by-side with the OTs, PTs and SLPs, co-running groups to bring in all the aspects of fitness. He works on core and appendicular strength, stability and mobility along with nutrition and daily well-being and health with a variety of clients ages three through young adult. Sean also works individually to build a world of healthy living with his cliental working on both fitness and nutrition in a playful fun environment promoting outdoor enjoyment and the fun of exercise. Sean works with his clients and their families to develop home programs using various technology based programs as needed. He works on promoting lifelong activity in youth. He is a certified emergency medical technician and fire fighter, along with being a US Army veteran and brings those experiences into the Creative Development environment, helping his clients grow and prosper with health bodies and minds. Laurie Dupree,billing coordinator is responsible for claim management for clients,billing, preparing invoices, and processing payments. In addition, Laurie continuously works with the insurance company to ensure proper payment and reimbursement for Creative Development’s clients. She has been working at Creative Development since 2011. Leda O’Connor, COTA/L, practice manager, earned her associate’s degree in Occupational Therapy from Goodwin College in 2017. She has a broad background working with the adult and geriatric populations as a Certified Medical Assistant & Medical Biller for 12 years, in both the hospital and private practice settings. She also has 10 years’ experience working with children, as a paraprofessional in an elementary school setting. Leda has worked with children and adults with Autism, ADHD, Cerebral Palsy, developmental delays, Down syndrome, sensory processing disorders, and various other impairments that affect daily participation. Leda enjoys being able to utilize her wide range of education and experiences while working with and caring for children and their families at Creative Development. In her free time she enjoys spending time with her family and friends, cooking, camping, and reading. Helaine Fortes, front office administrator BIO COMING SOON!